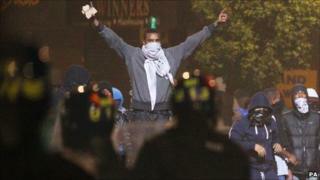 England riots: What's the evidence gangs were behind the riots? Gangs are being blamed for last week's explosion of riots and looting. But how do we know they were responsible? The prime minister has promised a "concerted, all out war on gangs and gang culture", in response to the riots and looting across English cities. A gangs taskforce is being set up, to be led by Home Secretary Theresa May and Work and Pensions Secretary Iain Duncan Smith. Bill Bratton, former police chief of Los Angeles and New York, is to advise the government on how to crack down on gangs. But were gangs really to blame? Here a number of experts and witnesses offer their view. The speed and devastation with which the riots spread suggests they were organised. This wasn't a general uprising, says Christian Guy, policy director at think tank the Centre for Social Justice. It was a well co-ordinated operation, which is likely to have been led by young people in street gangs, he believes. Daniel Weston, a youth worker in Brixton, says gangs in his area bided their time after the first night of violence in Tottenham. When they were ready to strike, gang leaders used Blackberry Messenger, a closed network not visible to police, to mobilise younger gang members. Targets were identified - typically Footlocker, JD Sports and Currys - and gang members directed to them. Normally their business is selling drugs. But during the riots they "put that to one side to" to turn their attentions to looting, he believes. Not all criminal young people are in gangs. Gavin Knight, who spent long periods of time "embedded" with anti-gang units for his book Hood Rat, says many see gangs where none exist: "People see a teenager in a hoodie and think it's a gang." In reality, there are few genuine gang members. And "all sorts of people" - teaching assistants, a graphic designer and university students - have been arrested for taking part in the looting. Paul Lewis, a Guardian journalist who spent five nights observing the violence, says it's wrong to try to put the blame on one group. Everyone's looking for a caricature yet those involved were a cross section of the local community. And each riot he saw - from Hackney to Gloucester - had a distinctive character. "There were a great number of people swept along. The only generalisation that's credible is that on the whole they were young and poor," he says. Most gang violence is aimed at other gangs. But during the riots the gangs appeared to join forces. Strict territorial divides preventing young people "slipping" into rival areas were temporarily forgotten. Weston says gangs were given a "hood pass" - a slang term meaning that youths were allowed to travel into another neighbourhood. "The gangs came together and forgot their rivalries," he says. For once, gang members from Peckham, Brixton, Clapham and Tulse Hill, allowed other's young people to move around unhindered. The informal truce didn't last long however. There have already been attacks on rival gangs to steal looted gear, he says. The loss of control by police in Tottenham gave young people ideas. But they weren't part of gangs, just "excitable young kids" who were easily led, says Knight. "It was random, chaotic activity not a co-ordinated uprising." There was no truce between gangs, the looting was simply so chaotic that normal rules ceased to apply, he says. A lot has been made of the importance of gangs using Blackberry Messenger. But Lewis - who was receiving the messages - says BBM was not "directly determining" the action but "loosely influencing events". The messages were more likely to be sent between friendship groups than gang associates, he believes. There were widespread reports of organised looting with rioters sometimes queuing to take goods away. Andrew Malone, special correspondent for the Daily Mail, spent two hours standing outside a Panasonic shop in Ealing. He describes a scene in which younger drug runners ferried the spoils to older gang members in nearby vehicles. "I saw people walking straight past me carrying flat screen TVs to BMWs and souped-up Golfs. There were even vans coming down." There was a gang hierarchy at work, he believes. The youngsters had the look of the "kids" he has seen cycling around estates selling small amounts of drugs. "It was people acting in concert in the same way you get with dealing drugs. There were juniors and seniors as well as opportunists." Weston agrees. "The older generation were the puppet masters pulling the strings. They weren't the ones doing the looting but they were getting the stuff." The primary purpose of gangs is to make money from selling drugs. Riots are the last thing they want, says says Prof John Pitts a criminologist who advises London councils on gangs. "You can't sell drugs when there's a riot. There are cops everywhere." The attraction of looting pales when you could be making several thousand pounds a day selling drugs, he argues. It may be the case that the younger gang members - who would be making amounts of £50-£100 - would see the riots as an opportunity. "The youngsters might have got involved. But I can't see why the elders would. Cameron is talking about the rioters and gangs as if they're the same thing. I don't think they are." Gangs are notoriously hard things to define and have become more fractured in recent years. But while gang members may be a statistically small part of the looting, a pervasive wider gang culture influenced many other young people to join in. "Even if they are not acting as part of a gang, it will influence their behaviour," says Guy. "The gangs are providing the sense of expectations, leadership and values." When Cameron talks of gangs he may be using it as a shorthand for the culture of instant gratification that commentators point to in gangsta rap, MTV and video games like Grand Theft Auto. The gangsta aesthetic is a style popular across all types of young people but most take it with a pinch of salt. The question, says Prof Pitts, is why a certain inner city section of society takes it so seriously. "My guess is that the kids most affected are those for whom it provides an explanation and an ennobling narrative to their life."